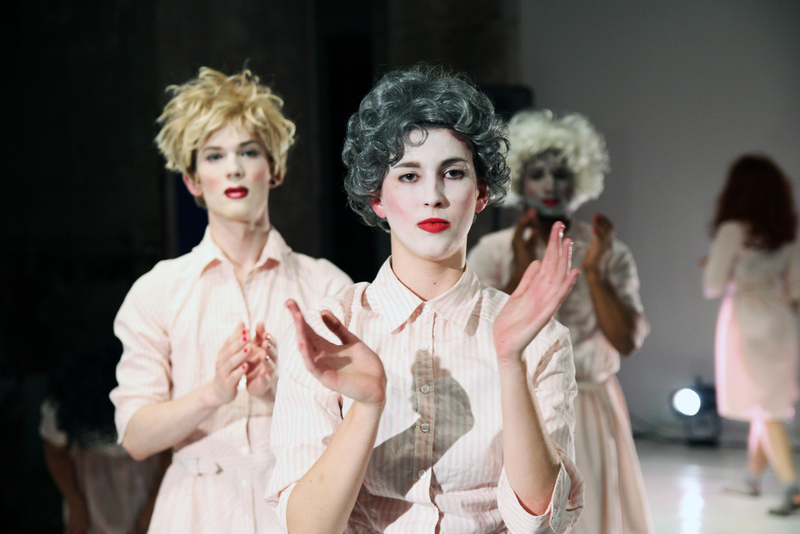 A movement-based drag performance essay inspired by Andy Warhol’s alter ego “Drella” — a contraction of Dracula and Cinderella. Beyond the focus on Warhol's legacy, DRELLA addresses Kelly's concerns with identity, sexuality and self-worth. In this Vogue-Ballet, Kelly creates a surreal world; a gender-bending, race-shifting, multi-medium “Artsploitation” in response to today’s consumer culture, and celebrity worship. A Very Pleasant Thursday Night Filled With Drag, Smashing Vogue, Cabaret And Ballet. "Baring Their Legs, The Six Dancers Perform Splits And High Kicks That Would Put The Perkiest Cheerleader To Shame." And A Bit Mind-Bending, Too. DRELLA was created in part at the Bates Dance Festival's 2013 Emerging Choreographer Program and funded in part by The Foundation For Contemporary Arts Emergency Grant Fund. DRELLA was self-produced at the Invisible Dog Art Center December 12/13 2013 and its’ reprisal was co-produced June 4-6 2014.